I’ve been searching everywhere for a way to make my linux fonts look as good as windows, Thanks so much for the link to the BCI freetype RPM. Ugly fonts was the one thing that keeps turning me off Linux. 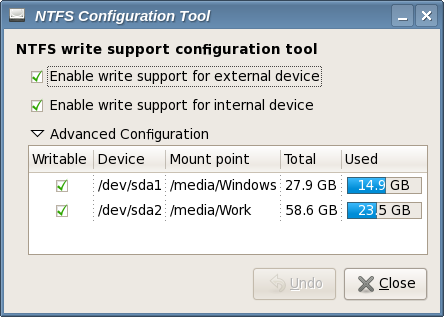 For NTFS, ntfs-3g is installed by default. All you need to install is ntfs-config (it is unsigned atm, so you will have gpgcheck=0 until it is updated…) and run it. It can set up both read and write support for internal and external ntfs disks depending on what settings you use. The kmod-ntfs method does read only as far as I know. Hi, yesterday one fedora installation here went wrong and the cause was using livna and freshrpms repositories at the same time. Steps to reproduce are: install f7, add both those repos and install mplayer using yumex. After that mplayer can’t start and is missing a tons of dependencies and is very very hard to fix. Using just freshrpms is enough for multimedia, at least here. Thanks for the font tip. Mixing Freshrpms and Livna can lead to a world of pain. Fred, this is why I’m showing which package to get from each repo. The commands above are certified to work. At least for now. You are assuming too much technical skill and linux know-how from your target audience… the linux user that actually needs your help. These users will probably keep both repos enabled and screw up their system. Please apply the freetype-2.3.4-ttf-overflow.patch security fix from the official freetype-2.3.4-3.fc7! Fedora 7 already includes a set of fonts that are metrically equivalent to the MS Web fonts, but big-F Free. Just “yum install liberation-fonts” if they’re not already installed. Thanks for the very helpful howto on Fonts. FSSGI, packages were upgraded and some dependencies were broken. Let me investigate and I’ll update this page in the next days. I install vlc and Mplayer only disabling livna repos with kyum. I think yuo had to enable freshrpm repo!!!! Do not use livna & freshrpm togheter!!! Thank you very much for your help. The advices I found in your website helped me a lot. I am an orthopedic surgeon in Jerusalem – Hadassah University Hospital – but I am working a lot with computerized stuff, trying to acquire more skills in linux. Good howto, with a little skill, it can be adapted to any system… almost. Right now I need some help on installing freetype-freeworld on CentOS5.1 if possible. Once I managed to find a newer EL5 freetype package and to rebuild it with BCI support, but now I’m stucked. Font a rather recent guide that has a Centos5 section. Wow man that was some real help.. awesome.. thanks a ton..
Avi, some of us who use Fedora in the corporate world will have to connect every now and then to hosts running MS Windows. For that, there are two useful RDP clients that are also not installed by default: rdesktop and freerdp. The former is poorly maintained, but it’s integrated with tsclient (a nice, multi-protocol GUI wrapper for remote session clients), while the latter is more up-to-date with later versions of the RDP protocol. Both apps are available from the stock Fedora repositories. Allan, I use remmina as an integrated solution for RDP and VNC. Its very well integrated to Gnome also. Just install gnome-applet-remmina to get the remmina package installed too. Remmina! Grat tip: as convenient an interface as rdesktop, and a lot more functionality, plus keeping updated with the specs! Thanks a lot, Avi!